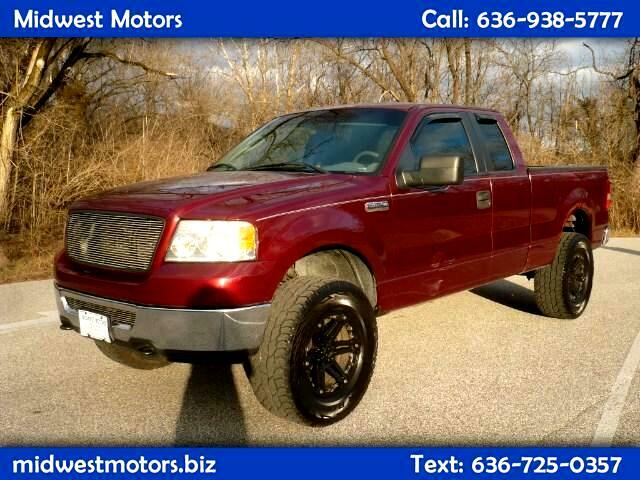 This 2006 Ford F-150 XLT SuperCab is ready for the job! With a reliable engine, Ford dependability, and a strong chassis - this truck is work ready for whatever you can throw at it. Tow Package! 4X4 - Four wheel drive! Cold A/C, CD Player, Tilt wheel, power locks, power windows, and more! Even power seats! Cruise control makes highway driving a breeze. Even the little things like power mirrors and tinted windows make this a truck you wont want to miss at this low price. At Midwest Motors, we have a large selection of cars, trucks, SUVs, vans, and more. Our team is dedicated to putting you into the vehicle you want to drive home in! We also offer truck upfitting services from lift kits to flat beds and truck beds, tire sales and installation, and vehicle maintenance, service, and repairs. We look forward to seeing you! Please give us a call at (636) 938-5777 so we can help you find your dream car, truck, SUV, CM Truck Bed, flat bed, or service and utility body!